Experience the exciting outposts of the Hebrides! Followed by gannets, fulmars and puffins we explore sites such as the green island Iona, the spectacular Fingal’s Cave on the small island of Staffa. We also take the opportunity to visit one of the many whisky distilleries the area is known for. Weather permitting, we reach the isolated islands of St Kilda, a UNESCO World Heritage Site and Scotland’s westernmost outpost. On these remote islands, people lived for thousands of years totally isolated from the rest of the world. The cliffs around St Kilda are home to the world’s largest population of gannets – over 60 000 pairs nest here. During the expedition we also learn more about the area’s rich history, marked by Vikings, Celts, druids and clans. We arrive in Glasgow and spend a night at a comfortable and centrally located hotel. After lunch we travel together to Oban and board M/S Stockholm – our home for the next seven nights. The following are examples of exciting places we hope to visit:Iona, Staffa & LungaIona has been a place of deep spiritual significance for more than 1 000 years. No less than 62 Kings of Scotland are buried here, including Duncan I, who was murdered by Macbeth. Saint Columba came here from Ireland in 563 AD and early Christianity spread through Britain from this remote island community. Weather permitting we make a stop at the spectacular island of Staffa with the amazing Fingal’s Cave. The cave inspired Mendelsohn to compose “The Hebrides Overture”. We also hope to be able to land on Lunga to walk amongst the surprisingly tame puffins.St Kilda We head toward the UNESCO World Heritage Site of St Kilda through the Sound of Harris, a remarkable uninhabited archipelago some 64 km from the nearest Scottish isles. Weather permitting, we drop anchor in Village Bay on the main island Hirta and wander through the remnants of the village. St Kilda once supported a population of 200, but the last islanders were evacuated in the 1930s. Recent restoration work on the village by the National Trust for Scotland offers an interesting link with the past. Later we cruise past the impressive island of Boreray, Stac an Amin and Stac Lee, where tens of thousands of gannets nest.Callanish StonesOn the northwestern side of Lewis we visit the Callanish Stones, a cross-shaped setting of standing stones erected around 3000 BC. This is one of the most spectacular megalithic monuments in Scotland.DunveganDunvegan Castle is magnificently located on a rocky outcrop on the shores of Loch Dunvegan. The castle is the oldest continuously inhabited castle in Scotland and was the ancestral home of the Chiefs of Clan MacLeod for 800 years. In contrast to the surrounding landscape, dominated by barren moorland and mountains, the gardens here are like a hidden oasis. Here we find an eclectic mix of plants, woodland glades, shimmering pools fed by waterfalls and streams flowing down to the sea.Canna & RumThe small island of Canna has a tiny agricultural and cattle rearing population. From a walk along the cliff top we may see golden eagles, white tailed eagles, puffins and peregrine falcons. The island is beautifully situated with stunning views of the area. The neighboring island, Rum, is a nature reserve and an oasis for birdwatchers. More than 150 species have been observed on this small island. If possible, we pay a visit to Kinloch Castle, an eclectic 19th century turreted castle built by the Bullough family, and walk the nature trail, a beautiful area of wild flowers. We return to Oban and disembark M/S Stockholm in the morning. Transfer to Glasgow International Airport or Glasgow Central station is included. This is a preliminary itinerary. Our exact route will depend on the weather and wind conditions. Please keep in mind that flexibility is the key to a successful adventure! Vessel Type: Small Ship Length: 195 m Passenger Capacity: 12 Built / refurbished: 1953 / 1999 The M/S Stockholm is a classic ship built in 1953 for the Swedish National Maritime Administration. In 1999 she was totally refitted and started her career as a comfortable polar passenger ship. 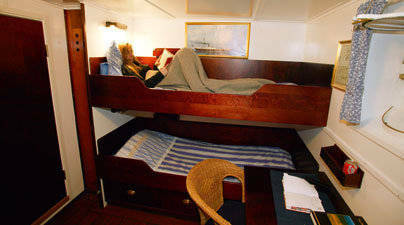 The M/S Stockholm carries a maximum of 12 passengers in twin cabins with bunk beds. All cabins have private facilities and small windows (portholes). M/S Stockholm is a marvellous piece of maritime history with beautiful brass details and wooden decks. It is no wonder she is loved by so many! On board the ship you will enjoy delicious meals in the company of likeminded travellers, who are all fascinated by the Arctic nature, wildlife and history. The food on board is of high standard and all beverages are included in the price. With such a small party on board, this is like travelling on a private yacht. The crew on board M/S Stockholm are also great enthusiasts of the unique wildlife and unspoiled nature. 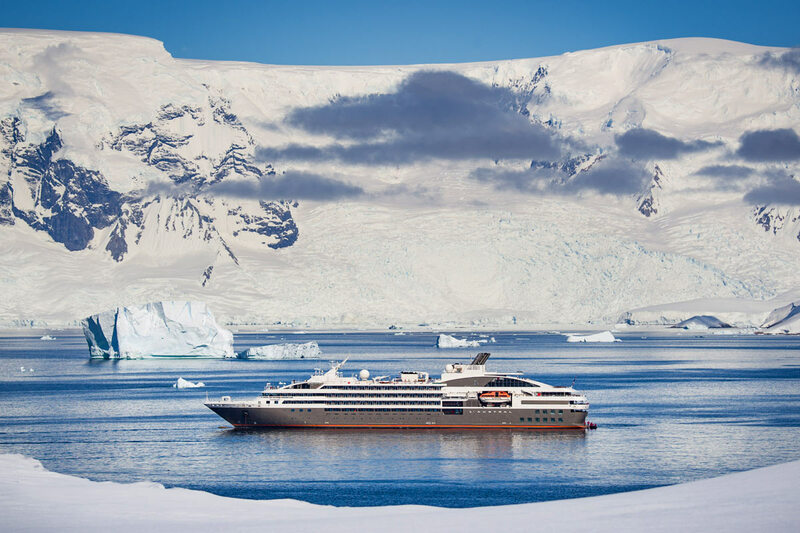 Their genuine curiosity is a prerequisite for expedition cruises of this kind. A trip on board M/S Stockholm in these northern waters, with its unique wildlife and pristine nature, is an experience of a lifetime!